A month into my trip and travels thus far are filled with highs and lows; there were a few days last week where I just wanted to give up, which is normal on any given trip but usually later into the travels. Once Gary left, and I was on my own again, I was overwhelmed with the weight of balancing work and solo travel. But, I met new friendly faces in the past week, and partnering up for a few days helped straighten out some of the discombobulated feeling. Pushing through the overwhelm, I finished out my time in Cape Town and caught a flight to Nairobi, Kenya. Arriving here was a surreal flashback to Mumbai—bustling traffic, congestion, and drive from the airport lined with slums. This is far from the Africa of travel brochures. A region that calls home to the “Big Five” animals travel dreams are made of is also a struggling, developing economy. 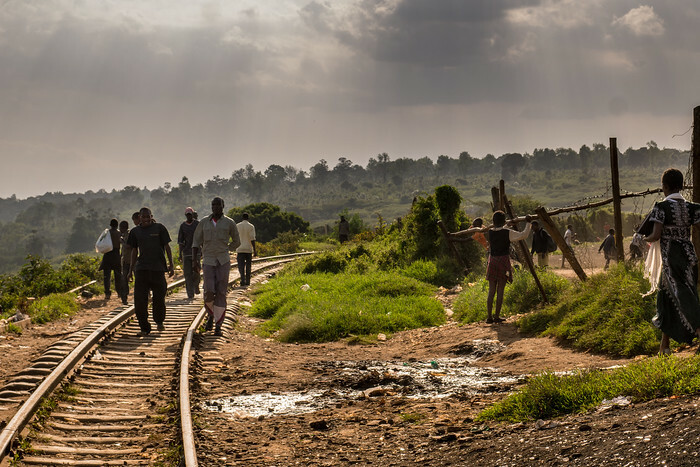 Walking the railroad tracks in Kibera, Nairobi, Kenya as the sun is sitting low and workers return home for the evening. The moment I landed, however, my driver’s enthusiastic exclamation of karibu!—which means welcome in Swahili—had me smiling. Language barriers are a fear point for many travelers, and I can only say that the gap here is small. Nairobi hums with English and Swahili both as lingua franca, and most Kenyans speak with fluency. Which makes traveling and learning about the country infinitely easier. Taxi drivers are fonts of information on this trip. Travels in Asia are often filled with stilted conversations and games of charades, but my African drivers converse with the skill of a veteran barman as they the bob and weave through gridlock traffic. They field any topic you throw their way with ease and insight, though the talk here, as in South Africa, often circles back to poverty and politics. All smiles and a wealth of knowledge from our guide as we visited music projects and local initiatives in Kibera. And as we talk of life (and even philosophy on one late-night ride) my taxi drivers ask me about America. The great American dream is alive here, and throughout most developing countries I visit. Yet it’s skewed. Hollywood and our media have done an excellent job selling others on the big dream, and my drivers are shocked and most don’t believe me when I mention things like poverty, racism, and homelessness in the United States. Our poverty is relative rather than systemic like in many developing countries, but these issues are not a part of the consciousness outside the U.S. We are a vast land of opportunity in comparison, this is not an argument against the U.S., but we are far from the Utopian image portrayed outside our borders. It’s hard to explain to them that we have traded much for the sake of our take on prosperity. A moving documentary I watched last year, God Grew Tired of Us, follows three Sudanese men on a journey from wandering across sub-Saharan Africa to life in the U.S. Their initial elation gives way to deeper insights as the boys remark on the odd state of our communities, the unconnected lives we lead from each other, and the hard work it takes to even to subsist for many Americans. Like the route our taxi took through the city, our conversations wove through all these complex issues this past week as I made my way through three airports and three thousand miles. In the way of weaving, let’s shift topics a bit. I mentioned last week my plan to visit a township in Cape Town on the recommendation of many travelers and as many South Africans. The resounding question is: what did I think? My conclusion is muddled. I just don’t know if this is a positive form of tourism. It had never before occurred to me to partake in one of these tours, but somehow I found myself on two tours in one week. The standard recommendation is to find the right operator, one using the funds to build community projects and empower those in the townships and slums. There is, without a doubt, great need in these areas, but as much as I push local-level tourism, this feels off on a large scale. 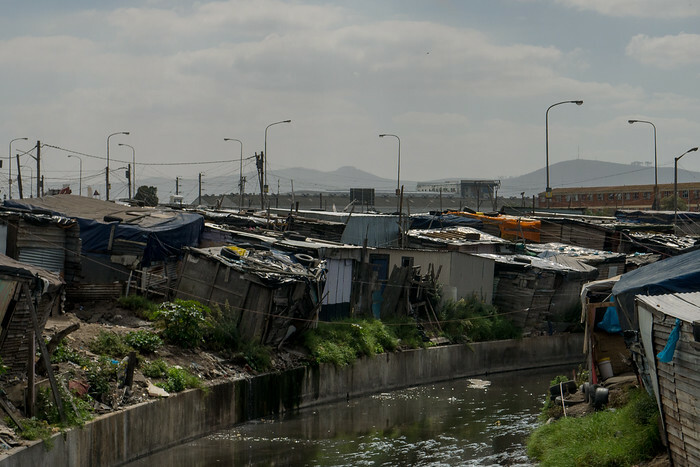 I didn’t love my Cape Town tour, and yet two days later I took a new friend up on a chance to see a different side of it all as he looked for partnerships in the Kibera slum in Nairobi for his music charity, Bridges for Music. I tagged along in the hopes of seeing an alternative side since we had a purpose, a reason for being there. And it was interesting, I learned a lot and saw incredible initiatives within the slums and heard some excellent local music to boot. 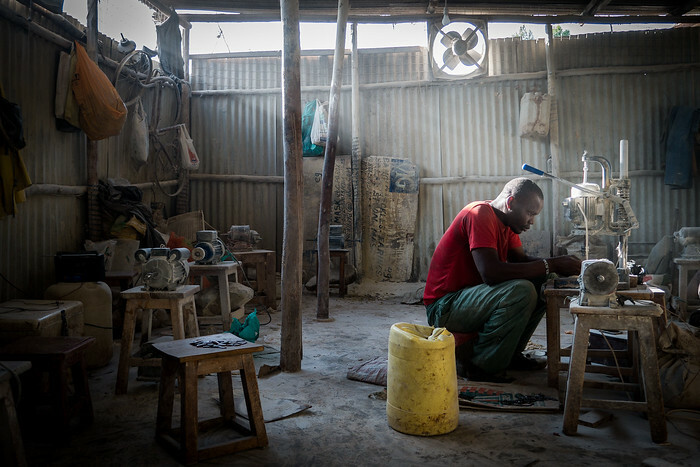 A worker grinds bone into jewelry for sale locally in the markets and to tourists in Kibera. But in both places, our guides carefully mentioned the need to photograph areas and not people as we walked the streets, to not peer into homes and invade their privacy… and having to stress that this is not a zoo-like experience (their words) is the very reason I can only say that mass slum tourism is an ethically ambiguous area and as such, others should tread carefully. And one last thought, NGOs catch a lot of flack in Kenya and it only furthers this idea of whether aid and development are progressing in a positive direction. Cynicism abounds, especially in the projects within Kibera, and it didn’t take long for locals to point me to Aid for Aid, a home-grown parody series about an international NGO that accomplishes nothing but is filled with do-gooders. Switching countries came with a marked change in the attitudes and welcome here in East Africa, and these next weeks have me jazzed once again. When I asked the community for recommendations on grassroots projects, you guys gave me heaps of wonderful work being done over here! Enough that most of my weeks are planned out from here until June when I head home. So, thank you. And, if you have any others, let me know, I can always squeeze in more along the way. Next week’s update is a big one for me as I am visiting my first safari this weekend! I’ll make sure to edit my photos asap so I can share photos of the Big Five—lion, leopard, rhino, buffalo, and elephant. This post opens up a new topic which I never thought of.. “Slum Tourism”. Are we going to see people dwelling in slums? As a tourists? Yes, that is the essence of this type of tourist experience. Good question! They asked us not to take photos on the streets because those people had not consented to being photographed. I had a guide though, and he took us to several local businesses that were operating as social enterprises, hiring locals with fair wages, and they were very keen to have us photograph and tell their story. The identifiable people in every photo in this post are related in some way to my guide and gave permission or I would have never published them. They were eager to have their stories told more widely, and this shop in particular in the photo you mention is one that hires people from the slums to make jewelry that is sold in the tourist shops elsewhere in the city. I have always felt that slum tourism isn’t right, it has always seemed like a zoo-like experience to me. People seem to think it is OK to go and gawk at the poor and marvel at their lives but ignore the poor and homeless in their own countries. It is weird to me. In countries like South Africa where there is so much corruption, I wonder if any of the money paid makes it to the people of the townships. Thanks for sharing your experience. I tend to agree that the gawking angle to it all makes it tough to swallow. There is often great need at home, and yet I can see the point that if the money is going into local businesses then there is good. It’s a tricky subject because there are local operators working within the communities and investing the money back into lifting the level of poverty, and yet the intentions of the tourists visiting don’t seem to play well with that idea of helping. Thanks for weighing in on this, there is just no easy answer. It’s interesting how poverty tourism is becoming a trend. I have enjoyed solo walks through the poverty areas and met terrific people who were thrilled to meet someone who cared enough to visit where they live and chat with them. There’s not much anyone can do by themselves but as a community, we certainly can help raise awareness and create movement for better living conditions. It’s not advisable to do solo walks but certainly worth it if you know someone who is an integral part of the community and willing to guide you in exchange for support instead of profit. Good for you to step out of your comfort zone. Thanks for weighing in on this Mark. As you noted, I found it very interesting to see that side of the tourism industry, and even more so I took away a new perspective on Nairobi and Cape Town from those visits. I think it’s important to make sure that you have a solid perspective on why you are visiting, and a local guide does help ground the experience. Both seem like poor solutions to the issue — Mumbai has attempted to mask it some as well since it’s the first thing you see leaving the airport, but the city is now realizing there is big money in walking tourists through the slums. Correct. Just band-aid solution by the government. And the poor remains marginalized. Thanks for including the link to the company in Manila, I would be keen to visit one day and learn more about what Smokey Tours is doing. 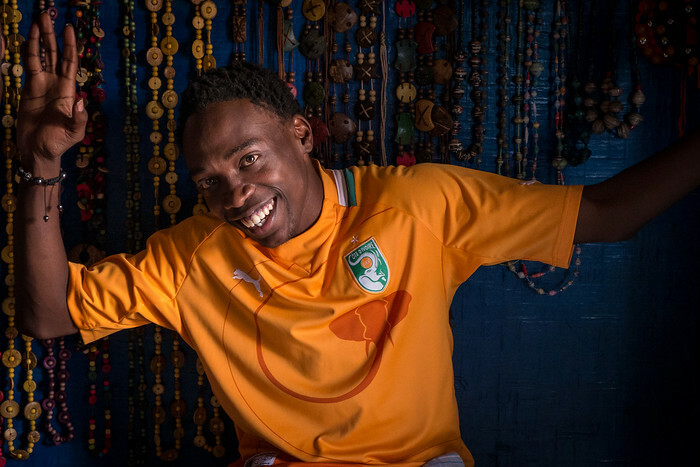 For the slum tourism, it really goes both ways for me — I do see the value, truly, in connecting toursim into regions; I think it comes down to the organization running the tours that makes a difference. I would love to experience it first hand, I am curious about it! I’m actually from Tondo. I also have volunteered before, like feeding programs and community outreach in Baseco area and the “ulingan”. I would love to visit again in the near future. Always love hearing about your travels, Shannon. I was interested to read what you thought about slum tourism, as I’ve had the same reservations. I still think I’ill eventually have to go on a tour to solidify my opinion, but I enjoyed reading your perspective. Enjoy your first safari!! Wow this is a really intense article with some great points. It is interesting how globalization can connect us to people, like the taxi driver, but can also falsify our true identities as nations. How can we improve transparency across nations to further communicate complex transnational issues?? A good point and a question I don’t think we have found an answer for yet. Thanks for weighing in, it can be so tough to travel to these regions and know what is the best course of interaction. Where is a place where you have seen the most health interaction between tourism and locals?? I am curious since you talk a lot about poverty tourism in your article. That’s a tough question, mostly I see how tourism breaks a place (Nepal) but I hear that Rwanda has a wonderful model in place, so I will keep you posted. I understand the poverty tourism conundrum – and its one of the reasons I haven’t taken a township tour in my own country. I also don’t know what to do when I see people living their normal lives, but being gawked at by tourists (and I’m guilty of it myself). I love watching people and seeing how they live, but they are not animals in a zoo. I wish I knew what the answer was. Tourism is very important in many different countries around the world, but its important that the locals are not gawked at. In some respects South Africa is a great place for westerners because you’re not immediately identified as a tourist – but there is still the rest of the world…. beautiful country sadly wanting of a decent life. Well said Hamish, there is much need in the world and wealth and resources to go around. Safe travels. Hi Shannon, I just want to let you know how amazing I think you, your website, your resources, your photography (basically everything you do) is. Really inspiring. I admire your honesty and I too relate with the highs and the lows that occur during travel. My lows often occur within the first few days (wondering what on earth I’m doing and often consider leaving…) and Africa was a whole new challenge for myself. Nothing lasts forever and once the low passes I am more than content I stuck with it (and often don’t want to leave). I am beginning to plan my travels with hopes of being able to travel and support myself too (hopefully with something online). Your site is priceless for information and I cannot thank-you enough. Thank-you for all you do and I wish you all the best for your travels and future goals. Thanks for the good energy! As for picking a starting place, don’t let that decision be the one that holds you back. You can go easy, like starting at a regional hub city (Bangkok, Bogata, etc) or pick a place you have long dreamed of seeing and start with that. Anytime :) I find your comments really helpful and I do just need to pick a starting point and then go (otherwise I’ll be looking and waiting for the “perfect” plan/route and will never get anywhere). Will let you know where I begin with hopefully an online presence too (a blog/website. Something else I just need to begin). Thanks again for the motivation and for putting things in perspective. I think it’s one of those things that you don’t know for yourself until you try it for yourself and as what you did, sometimes it needs to be done more than once to somewhat comprehend for yourself. Have fun on safari. Go up in the hot air balloon if you get the chance..
ps Love the word discombobulated! Thanks Jimmy! I am glad that I went, as you said, you have to go to form a perspective — I just hesitate to recommend it widely because of the potential negative impact of this type of toursim at a large scale. A tough moral issues. I didn’t get to make it up on the balloon :( But it was still amazing and I hope to share photos this week! Yes, it is difficult to figure out wether or not to visit places such as these. One one hand, as you pointed out, there is the human zoo aspect of it. On the other hand, how can anyone help if no one knows about it. Personally I am a bit tired of seeing, like the people obviously here are, NGOs and other organizations that try to impose a solution on these people. It is usually wasted. I am very tired of seeing “NGOs” win an agenda that involves someone changing their religion before the organization will help. Aid is always so complicated. Such a complicated area, and that is one of the things I like about the tours to some extent — it gives you a chance to infuse money directly in the local businesses and initiatives that are designed by the locals, not foreign NGOs. Tough one to call, I appreciate your perspective on this! Shannon. So true about slum tourism. On one side it is important. We, as travelers, should be paying close attention to all of the things a country is. If we can help, so be it. And I believe that no one wants to feel like they are being photographed like they are in a zoo, rich or poor. Great post! Thanks Corinne! It’s so important to see the different sides of a place, and in South Africa in particular the townships are such an important part of the country’s history, which makes it valuable but tough to recommend at a large level. Thanks for weighing in on this! This post has a lot of heart, Shannon. And it’s thought-provoking. I’m aware of slum tours and, like many people, have really mixed feelings about it. The objectification side of it is tough to swallow, but on the other hand, if the money goes toward helping the people, it could be a good thing after all. Thank you Dela, it really hard to find the balance in the situation — I am a proponent of infusing tourism dollars into communities at the local level, but my hesitation comes when that action may jeopardize their right to dignity… Thanks for sharing your perspective, I appreciate you weighing in here. I definitely have mixed feelings about this having grown up in Africa. I think witnessing poverty is powerful and people traveling in these countries and not going into the compounds are defintely missing something, but at the same time its very unsettling to think of people paying for a tour of poverty or taking pictures like people are wildlife. I’ve always hated people taking pictures of themselves holding an african child and posting it all over the internet, probably without ever asking permission of that child’s parents. I think the idea of going in with a respectable group and not just taking picutes like another safari but being educated makes the thing seem more legit. Agreed, witnessing the poverty is a powerful motivator for change, for motivating outsiders to care and take up a consciousness about the lives of people outside their home culture — but it’s just so hard to find the balance because it lies in the approach the tourist is taking, their mindset. The tour operator can only do so much if the tourists only go and see pity and the differences in their lives. A tough subject, and I agree though, I am not throwing the baby out with the bathwater and on my resources page I plan to list out a few of the more respectable tour companies I have found for the tours just in case it’s something someone wants to experience. As usual, a fantastic post Shannon. Even here on a small Caribbean island, I hear islanders complaining about cruise ship tourists being driven around in huge vans and take photos of the locals standing on the side of the road waiting for a bus…a few of them have taken to screaming “you’re not at the zoo! !” at them, which I can certainly understand. It’s a delicate balance. With the cruise ship dynamic I can imagine that it adds a whole other dynamic to the situation because the many of people on those tours are approaching travel from an entirely different perspective than backpackers or overlanders. It’s a shame that there aren’t yet better ways to form the interactions of cruise ship tourists with the places they visit. I cried too, when they just keep persevering despite being lonely and having no community, the spirit they keep alive for the sake of their families back home — that’s a resiliency that really struck a chord with me. Like you, I found myself referencing the film when the Kenyans tell me how rosy life would be stateside. Thanks for sharing your perspective on this from Honduras. We did not tour a township when we were there, I felt very uncomfortable about the zoo aspect of it. The poverty is just horrible, and what can anyone really say about it? We did a Massai Village in Tanzania and it was a worthless thing to do, it was completely commercialized. Sorry that the Maasi village didn’t work out — the people on my safari wanted to do one as well )(probably the same one you did) and I agree — not a very good window into the culture. Later this month I am checking out a cultural project in Kenya with the Maasai that I have high hopes for — it looks like it honors the culture of the Maasai while still allowing visitors to experience it in an authentic way (http://majimotomaasaicamp.com/) I’ll be reporting back on it, but it looks intriguing. I will look forward to hearing about it. Sharon, if you’re still in Kenya and looking for grassroots projects, be sureto ccheck out kiberastas, a soccer club made up of slum residents slowly making its rise up the Kenyan soccer charts. Thank you for the rec Carol — I will be back in Nairobi in late April so I will get in touch with them. I agree that this project sounds like a wonderful lens through which to see the area and the journey of the people within Kibera — I look forward to finding out more about it. The point you make about slum tourism is an interesting one as it is such a moral grey area and I find myself becoming more cynical about the concept. Originally, the motives, I’m sure, were well meaning but I feel more and more it’s just there to feed our curiosity without actually doing any good. Admittedly, I have volunteered in a favela where I was of no use and a naive do-gooder but I now realise that just because I want to help doesn’t mean it’s the right thing to do. I’d be interested to see what you make of it later on in your trip. Exactly, I find it hard to justify the tourism on a large scale because of the motivations of the tourists, their reason for being there. On a level where it’s a meeting of cultures, that’s one thing, but as it becomes an industry, there are just too many tour operators who will skip the positive side of in in lieu of profits… such a tough one to call, I’ll think on this more and reflect at the end of my time in Africa perhaps. Thanks for sharing your perspective Naomi. I’m so enjoying following your adventures through Africa. I was in Swaziland for 3 months last year, so it really brings me back. I appreciate your thoughts on poverty tourism – I also find myself straddling the moral grounds of that issue and international aid work in general. Also, your photos are spectacular! Can’t wait for images from the safari! Thank you Riana! Back from the safari and it was incredible — photos coming soon! The poverty issue is so tough, some people in the comments and via social media brought up some great points countering my argument, but at the end of the day, it remains a grey area.